CM Magazine: Snake in my Toilet. (HIP-JR.). Snake in my Toilet. (HIP-JR.). G. T. Sherman. Illustrated by Charlie Hanatiuk. Toronto, ON: High Interest Publishing, 2014. Teacher's Guide for Snake in my Toilet. Half asleep, I walked to the bathroom. Two yellow eyes glared at me from the toilet. I blinked and looked again. Something dark filled the toilet bowl. Something moved in the toilet bowl. It looked like a snake. A snake? "A snake!" I screamed. "A snake! 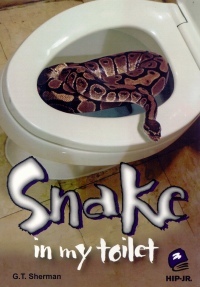 A snake in the toilet!" .... I stood frozen to the spot, still screaming. My mom grabbed me and checked for blood. "A snake!" I hissed. "There's a snake in the toilet." "Eeuw!" screeched my sister, Ella. She hates anything that's creepy or crawly. Sometimes I think she's not that crazy about me, either. We all looked down at the toilet bowl. It was empty. Just imagine seeing eyes in your toilet bowl! Pet snakes that escape their cages often will seek warm, dark places to hide. Unfortunately, that can mean they will be found hiding in a closet, under your blankets, or yes, in your toilet. Things always seem to be going wrong for Cameron. Not only is he the smallest kid in grade 8, but the school bully loves to pick on him and even some grown-ups give him a hard time. His dad is away at work in Panama, and his mom is always on his case. Now he has found a snake in the toilet and has to go to the next apartment when he feels nature's call. Then one day when he accidentally hurts the gym teacher and is suspended, he stays home while the exterminator tries to capture the snake in the toilet. Everyone has advice on how to catch the snake, but many of the solutions would be harmful to it. Other suggestions include knowledge of a snake's diet or habits. Readers will certainly learn many details about the animal. Cameron learns something about himself during this stressful time. He is able to face danger and realizes that he is not the crybaby others think he is. The fast-paced chapters have exciting endings that entice readers to keep reading. The black and white sketches that enhance the plot, characters and the drama of the story are detailed enough to not appear childish. HIP Junior novels are designed especially for the reluctant middle years reader. While the reading level is at grade 2.5, or Guided Reading level M, the interest level ranges from grade 3 to 8. The double-spaced font is easy to read, and hyphens are never used at the end of a line of print. 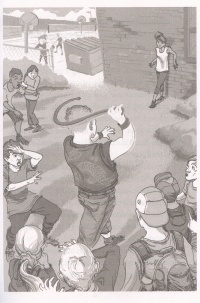 The accompanying teacher's guide explains how the books include picture support and real dialogue. Jamison's teacher's guide includes exercises in vocabulary building, group procedures, information about the author and activities for each chapter. There are good activities on similes and double meanings. The graphic organizers will help readers to organize their thoughts. Information about the series, levels, teacher and parent information and even online books can be found at www.hip-books.com. The teacher's guide for this book is available only as download in PDF format. The guides for future "HIP-Jr." books will also be in this format which is significantly cheaper than the $7.95 charged for the previous hard copy guides. According to the publisher, the print guides for earlier books in the series will eventually become downloads as well. 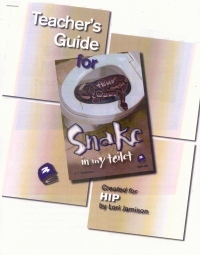 Snake in My Toilet and the "HIP-Jr." series are certainly worth looking into and are highly recommended for any classroom or school with reluctant readers.